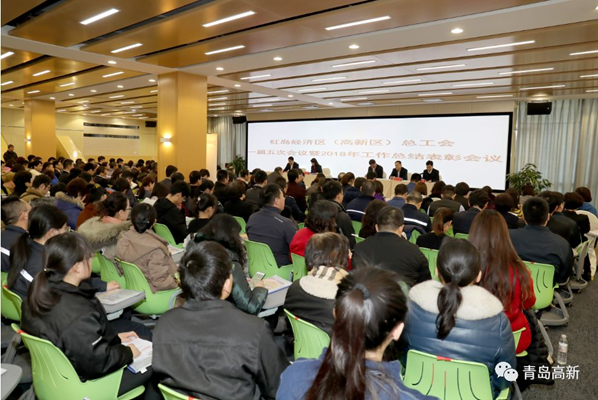 On January 16, the Federation of Trade Unions of Hongdao Economic Zones convened the fifth session of the first meeting and 2018 annual work summary and commendation conference. He Shi, member of the working committee of Qingdao National High-tech Industrial Development Zone, attended the conference. Related notice was read out at the conference. The conference awarded outstanding units and advanced individuals of 2018, and leaders of the Federation of Trade Unions of Hongdao Economic Zones delivered the annual work summary report. He Shi said that federation of trade unions at all levels should strengthen their political responsibility and ideological guidance for the workers; at the same time, we must follow the theme of the times and strive to simply and implement the detailed works; we should continue to deepen reform and build a contingent of trade union cadres for the new era. At last, he stressed that it is necessary to enhance the sense of service, give play to the role of the federation of trade unions as a bridge, guide officials and workers in the whole zone to focus on the overall working idea of "2311", and create a new situation of the work of the federation of trade unions with higher target positioning, greater work strength and more practical work measures.